So I still have no idea what this book is about, but the teasing mystery of the blurb really has me intrigued. "What really happened? Someone knows. Someone is lying." I'm maddened! And I love the promise of something magical realism-y, quasi-supernatural. 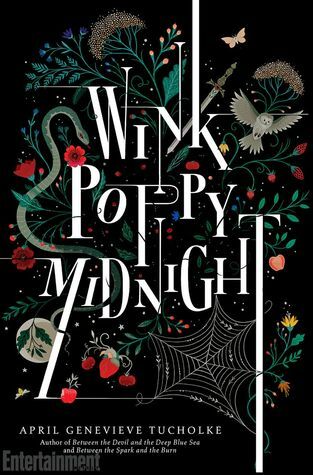 Plus, to the point, this cover is a gorgeous quilt, an old fairy tale cut and Picasso-ed into something dark and entrancing. Even though Between the Devil and the Deep Blue Sea was just okay for me, it was mostly because of the characters. I'm looking forward to more of Tucholke's gorgeous writing. Yet another Marilyn Manson cover, this one of "Golden Years" by the most dear David Bowie, who left us yesterday. Manson's tribute is so emotional and raw, and the creepy Alice in Wonderland video is pretty kickass too. A fitting memorial to the king of the strange and odd. Added this to my wishlist. Thanks for sharing. That book cover is so pretty! I'm so intrigued! It does have a magical realism look to it! Right? I thought the cover really fit with the mysterious blurb. I love the typography of this cover (so many covers lately mainly features texts which I'm really liking)!! I've never read anything by Tucholke but I just might try this one! Yes, that's what drew me to it! I love cool text. Aw, thanks! The lovely folks at Charm & Co. made it.